Mobile Cloth, my long-time favorite cleaning cloth for my iPads and all my touchscreen devices, has just released a new version – the Z5, described as ‘newly refined and colorized’. 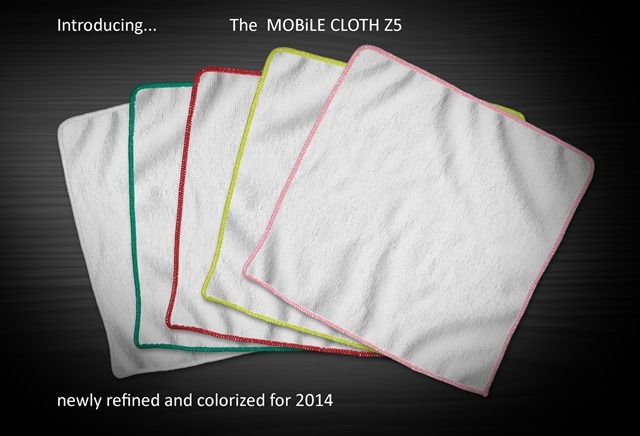 2014 is about refinement for Mobile Cloth. A new rounded edged continuous stitch technique and regal colors make the most effective touchscreen cleaning cloth, the most elegantly designed as well. 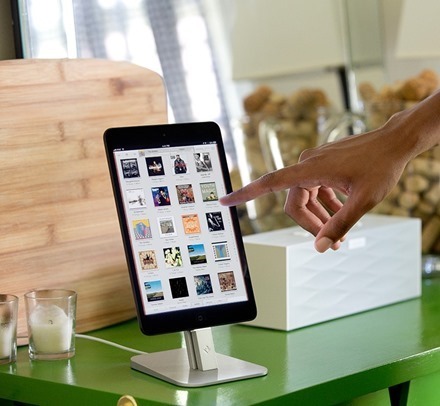 The “Z5” has all of the properties that makes the “Classic” and “nano” so effective but in a more refined design that understatedly brings good taste to the daily ritual of caring for one’s iPad and Tablet display. The Z5 contains the original MOBiLE CLOTH formula made of split micro fibers 100 times thinner than a human hair! The special split micro material found in MOBiLE CLOTH was ”both laboratory and clinically tested and proven to remove up to 98 percent of bacteria and 93 percent of viruses from a surface using only water (no chemicals)” 1 According to this study MC is an effective way to keep all touchscreen devices clean and germ free. I’m no expert on micro fibers, in fact I’m pretty clueless about them – but I do know that Mobile Cloth has always done a far better job at cleaning my device screens than any other cleaning cloth. It’s one of my most-used iPad accessories. You can see more details and place an order for the Z5 at this Mobile Cloth products page – the 5 pack is priced at $17.95. MarBlue is the new name adopted by Marware, who have been making some impressive cases for the iPad and other mobile devices for many years. 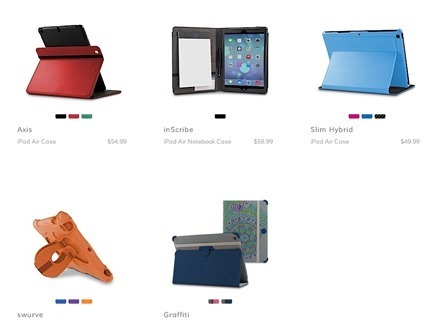 Along with their new name MarBlue also has a nice new lineup of cases for the iPad Air. They’ve got 5 new iPad Air cases ranging from $50 – 60. Most of these are folio / stand cases – though the Swurve is a little different back cover and stand case. I think several of these look quite nice, but the Slim Hybrid would probably be my choice if I had kept my iPad Air. 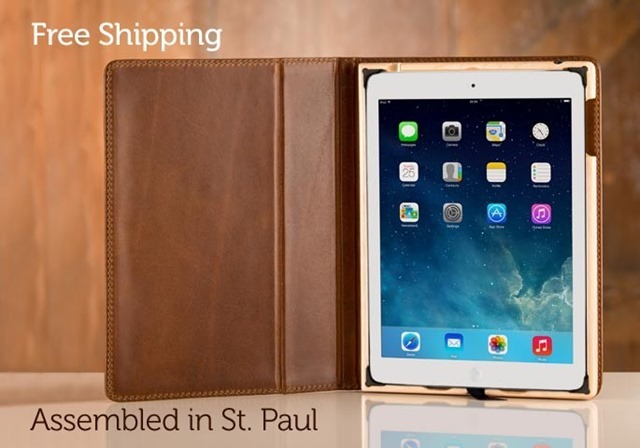 The latest iPad accessory from the clever folks at Twelve South is the BookBook Travel Journal leather case for iPad. It’s a vintage leather book-style case for the iPad and all our favorite iPad accessories. Twelve South are deservedly well-know for their stellar line of handsome accessories for Mac and iOS devices. The new BookBook Travel Journal looks like a great addition to the mix. 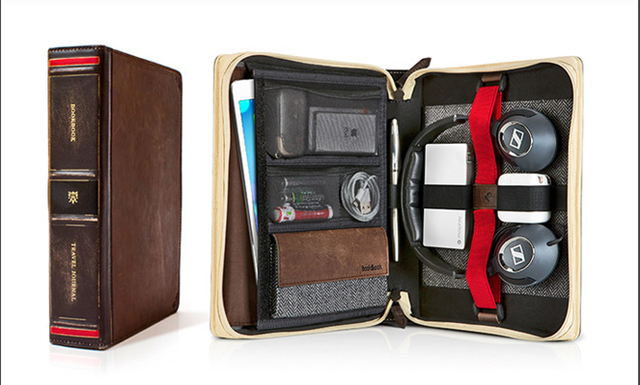 While the outside masquerades as a vintage book, the inside of the case has a soft-lined sleeve for the iPad, and a dozen adjustable elastic bands and pockets to house other useful accessories – like power and charge cables, stands, headphones, a stylus, cleaning cloths, and more. For those who make heavy use of the iPad while on the road or during the work day, this looks like a great alternative to chucking everything in a backpack or laptop bag. The only thing that might be missing, for those who need one, is a wireless keyboard or keyboard case. The BookBook Travel Journal works with all models of iPad Air, iPad mini, and iPad. It’s priced at $99.99. You can see more details and place an order at this Twelve South product page for the BookBook Travel Journal for iPad. I’ll definitely be looking to get hold of one of these for review. Gelaskins have announced that their excellent and genuinely ultrathin covers are now available for the iPad Air. I’ve tried all sorts of thin back cover skins for my iPad, but never found any that lived up to the ‘ultrathin’ description better than Gelaskins. They really add just about zero weight or bulk to an iPad, while offering some protection for the back cover against scratching. They’re literally less than 1mm thick – and can be repositioned relatively easily, which makes them easy to install. Gelaskins come in a range of unique and artistic designs, including many from well-known artists. The Dr. Gonzo skin has been my big favorite that I’ve used across several iPads. 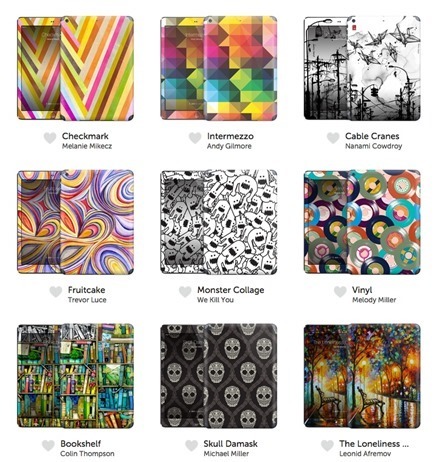 The new Gelaskins for the iPad Air go for $30. 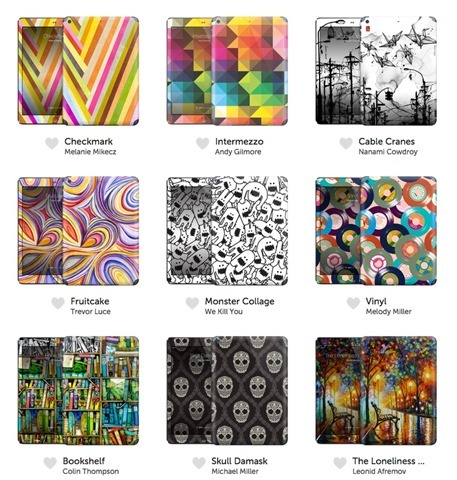 You can check out the wide selection at the Gelaskins iPad Air page. It hasn’t taken long at all to see lots of good cases for the iPad Air being announced by leading iPad accessory vendors. Logitech is among the latest to tout their new lineup – with three great looking new keyboard cases for the iPad Air. For starters, there’s a Logitech Ultrathin Keyboard Cover for iPad Air – extending this line of popular front cover only keyboard cases. 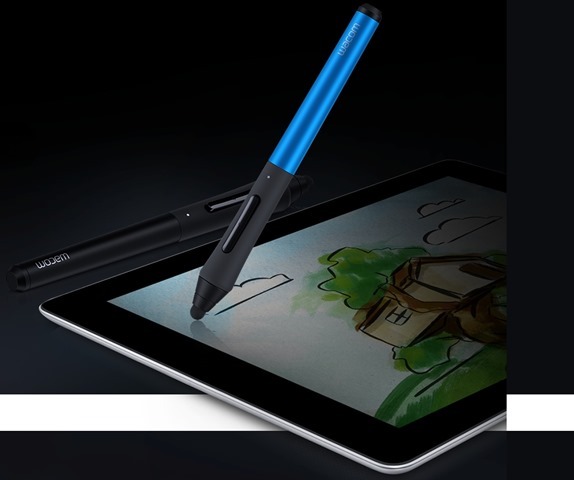 These nicely live up to their ultrathin name and look great as an iPad companion. I have reviewed these for the full size iPad and iPad mini in the past. I’m sure these will be popular with iPad Air owners too. The Logitech FabricSkin Keyboard Folio combines on-trend design with intelligent technology for thin-and-light protection with added functionality for your iPad. With a variety of colors and refined fabrics, this top-of-the-line folio brings beauty to iPad protection, while its water-repellent coating helps protect the front and back of your iPad Air. Its surprisingly thin built-in Bluetooth keyboard is seamlessly fused into the folio’s interior fabric. The full-size keys – complete with iOS® shortcuts – provide the familiar comfort of a traditional keyboard. The folio’s new SecureLock™ system sports lightweight, low-profile clips that keep the corners of your iPad firmly fastened to the frame, while an easy-release feature makes it easy to insert and remove your iPad. Hidden magnets hold your iPad in two convenient positions for typing or entertainment mode. The keyboard is rechargeable through micro-USB and can last up to three months on a complete charge. The Logitech FabricSkin Keyboard Folio is expected to be available for a suggested retail price of $149.99. Along with the unveiling of the new iPad Air and iPad mini with Retina display this week, Apple also announced some ‘smart’ new companions for them. As in, they’ve got new Smart Covers and Smart Cases for the iPad Air and the Retina iPad mini. The Smart Cover is Apple’s popular front cover only case that was the first ever to offer the automatic sleep/wake feature on a tablet – putting the iPad into sleep mode when closed and waking it up when the cover is opened. The Smart Case has the same ability but offers full coverage of the front and back of the iPad. 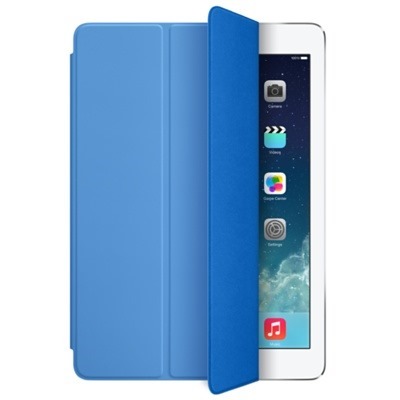 Retina iPad mini Smart Cover: $39 – Polyurethane – comes in same range of colors as the smart cover for the iPad Air.This case will also fit the original iPad mini. My Inbox is already filling up with emails from iPad case manufacturers, touting their new cases for the iPad Air and Retina iPad mini announced this week. These guys are on it like lightning when new Apple devices are announced. I’ll share some of the best looking and most interesting ones here as I see them. 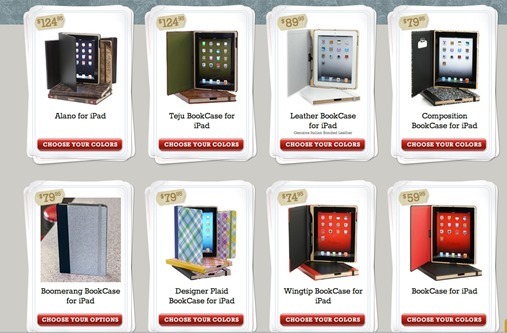 I’ll start today with Portenzo’s lineup of lovely handcrafted cases for both new iPads. They’ve got a half dozen great looking cases for both the iPad Air and Retina iPad mini that are expected to ship within 10 days of the official release (on 11/1). The Alano for iPad mini has lived up to and exceeded my high expectations for it. It’s a beautiful case that reeks of fine craftsmanship throughout and is a real pleasure to use. If you like leather-bound book style cases, this is definitely one that’s worthy of a lot of consideration. It will definitely continue to get lots of use with my iPad mini.